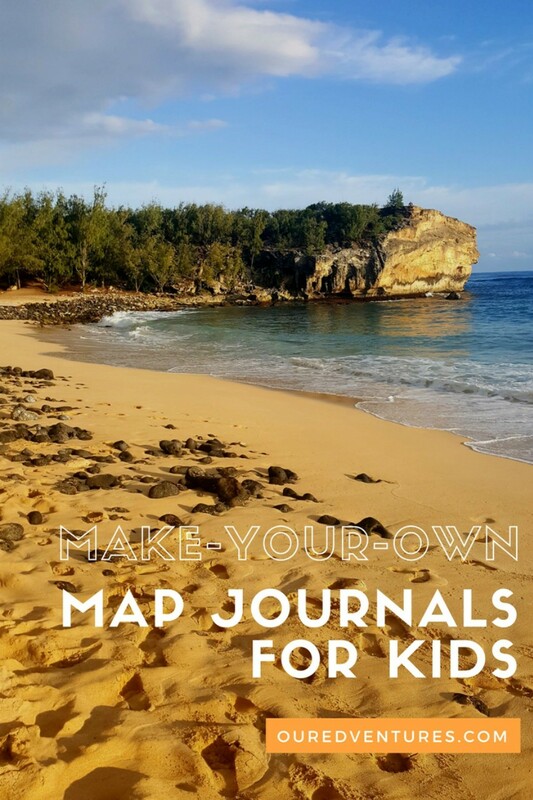 Travel journals for kids (and adults too) are great souvenirs for your trips. In the past, I’ve written about Instant Photo Travel Journals and Perspective Journals, both unique ways to document the things you’re seeing and learning about while traveling. Today I’m sharing the idea of a Map Journal. This is a particularly good way to document a trip if your destination includes multiple points of interest that can be better understood by interacting with a map. Map Journals allow kids to SEE the geography and layout of the area you’re visiting in a helpful way. A spatial display brings better understanding to the young traveler. Follow these simple directions for making your own Map Journal. 1. First, get a digital image (map) of the place you’ll be visiting. 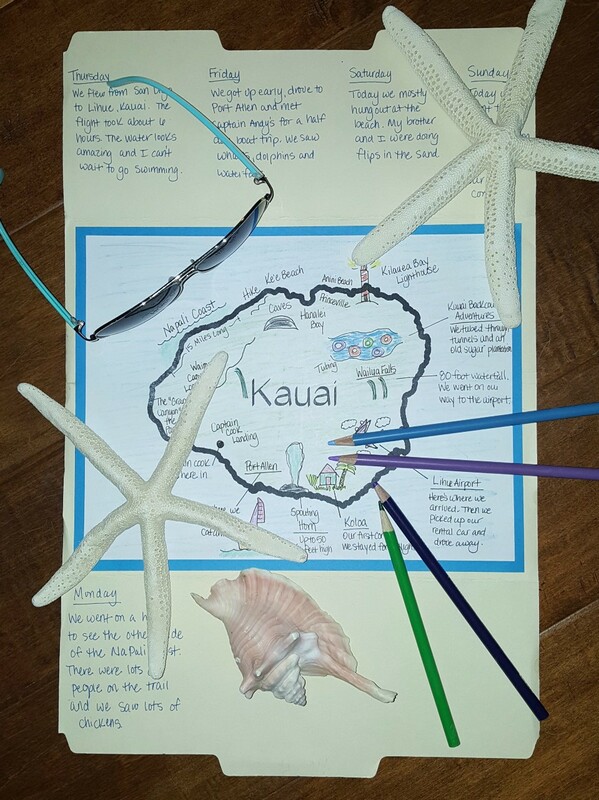 For our recent trip to Kauai (an island in the Hawaiian island chain), I just went to Google images and searched for a free Kauai outline. When I found one that I liked, I copied and pasted it into Word so that I could adjust the size and then printed it out. If you’re taking a road trip, search for a map that encompasses the entire area you’ll be visiting. If you’re planning to do a Map Journal of a city tour, then likewise, search for a plain, blackline city map. 2. Next, decide how you will display your map. We used a file folder, folded inward to make a booklet. We glued the map in the center, leaving the space above and below the map open for writing in details. 3. Bring along colored pencils, regular pencils, pens, scissors and double-sided tape. Each day as we visited a new location on the map, we added it by including a picture, title, and detailed information. We included the location of the airport, the condos we stayed at and all the places where we hiked, or did an activity. It helped for our boys to get a layout of the island spatially through working with a map. These Map Journals can be simple or intricate, whatever suits you best. Another way to display a Map Journal would be to take your small map to a printing store such as Kinkos and have them enlarge it to poster size and print it on heavier paper. You can then roll it up and travel with it inside a poster holder. If your family especially likes to work on group projects together, a more substantial sized Map Journal would a fun way to have room for everyone to work together. Plus, what a great souvenir to hang up when you get home. Of course, the sky is the limit when it comes to creativity! Have fun and make your Map Journal your own unique work of art!